1Center for Heart and Regenerative Medicine, Departments of Biomedical Sciences and Biomedical Engineering and Mechanics, Virginia Tech Carilion Research Institute, Roanoke, Virginia, USA. 2Vanderbilt-Ingram Cancer Center, Departments of Medicine and Biochemistry, Division of Hematology and Oncology, Vanderbilt University Medical Center, Nashville, Tennessee, USA. Address correspondence to: W. Kimryn Rathmell, Department of Medicine, Division of Hematology and Oncology, Vanderbilt-Ingram Cancer Center, Vanderbilt University, 2220 Pierce Avenue, Preston Research Building, Suite 777, Vanderbilt University Medical Center, Nashville, Tennessee 37232, USA. Phone: 615.875.9731; Email: kimryn.rathmell@vanderbilt.edu. J Clin Invest. 2019;129(2):442–451. https://doi.org/10.1172/JCI120855. The field of hereditary kidney cancer has begun to mature following the identification of several germline syndromes that define genetic and molecular features of this cancer. Molecular defects within these hereditary syndromes demonstrate consistent deficits in angiogenesis and metabolic signaling, largely driven by altered hypoxia signaling. The classical mutation, loss of function of the von Hippel-Lindau (VHL) tumor suppressor, provides a human pathogenesis model for critical aspects of pseudohypoxia. These features are mimicked in a less common hereditary renal tumor syndrome, known as hereditary leiomyomatosis and renal cell carcinoma. 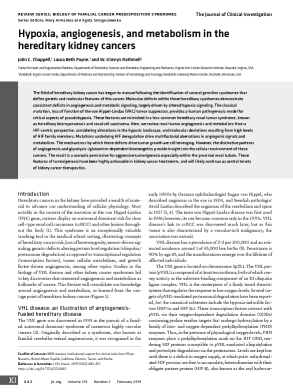 Here, we review renal tumor angiogenesis and metabolism from a HIF-centric perspective, considering alterations in the hypoxic landscape, and molecular deviations resulting from high levels of HIF family members. Mutations underlying HIF deregulation drive multifactorial aberrations in angiogenic signals and metabolism. The mechanisms by which these defects drive tumor growth are still emerging. However, the distinctive patterns of angiogenesis and glycolysis-/glutamine-dependent bioenergetics provide insight into the cellular environment of these cancers. The result is a scenario permissive for aggressive tumorigenesis especially within the proximal renal tubule. These features of tumorigenesis have been highly actionable in kidney cancer treatments, and will likely continue as central tenets of kidney cancer therapeutics.